Located twenty miles north of Milwaukee in Ozaukee County, the Town of Grafton borders LAKE MICHIGAN to the east and the VILLAGE OF GRAFTON and the TOWN OF CEDARBURG to the west. The Wisconsin Territory created the Town in 1846. While it shares much of its history with the Village of Grafton, the Town of Grafton’s development was also fueled by its proximity to Lake Michigan. When the first white visitors, French Jesuits from Green Bay, arrived in the Grafton area around 1670, they found a Native American settlement. The Grafton area was located along the Green Bay Trail, a Native American thoroughfare later used by many white settlers. The first white inhabitants in the Grafton area were YANKEE-YORKERS, who began arriving in the late 1830s and early 1840s. By the 1850s, GERMAN and IRISH immigrants were Grafton’s main residents. Although the area was densely wooded, many of these early settlers were farmers. Seeing opportunity in this abundance of wood, James T. Gifford established Port Ulao on the bluffs of the Town of Grafton in 1847. As farmers cleared their fields, Gifford bought their logs and resold them as cordwood to steamships traversing Lake Michigan. To reach his customers, Gifford constructed a 1,000 foot pier into the lake and a log chute from the bluff to the lakeshore. He successfully petitioned the territorial legislature and then the new state government for the right to build a plank road from Ulao to the interior. Though this road never stretched to the Wisconsin or Rock rivers as originally intended, it connected Port Ulao to the Village of Grafton. The road was one of Wisconsin’s first turnpikes. Despite early success, the cordwood trade declined; Gifford’s pier was used only sporadically until it fell into disrepair by the end of the 19th century. In 1856, the state recognized that Port Ulao would never become a village and reverted its small city lots to larger rural segments. The Grafton area had been cleared of its forests, and wood was no longer the chief fuel of Lake Michigan’s steamships. Without this trade, Ulao’s bluffs could not compete with better harbors like PORT WASHINGTON. Although the original village is gone, the name Ulao is still used for the unincorporated community located west of the former port, at the intersection of Ulao Road and the former CHICAGO & NORTH WESTERN RAILWAY COMPANY tracks. In addition to Ulao, the Town of Grafton includes the unincorporated community of Lakefield. Despite suburban growth, the Town of Grafton retains its rural and agricultural character. As of the year 2000, the Town had nearly 5,000 acres of farmland. 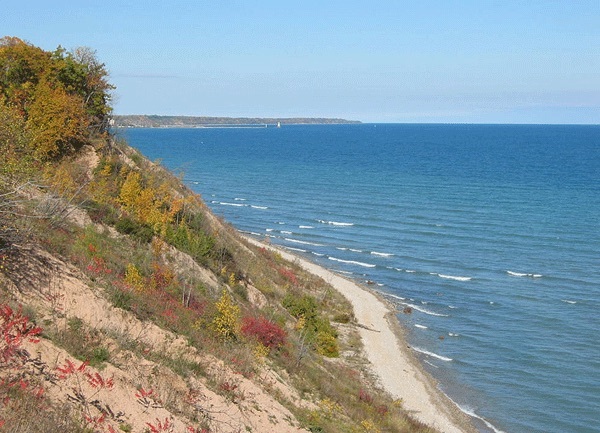 Rural homes and the Lion’s Den Gorge Nature Preserve line Lake Michigan on the Town’s bluffs. Like its neighbors, the Town of Grafton has seen a suburban population boom in recent decades. From fewer than 1,000 residents in 1940, the Town grew to over 4,000 in 2010. During this same period, the Town of Grafton has become geographically smaller. Subdivisions and developments have been annexed into the neighboring cities of Port Washington and CEDARBURG and the villages of Grafton and SAUKVILLE. While there has been discussion of combining the Town of Grafton with the Village of Grafton, the two Graftons remain separate. ^ Kathy Noltze, Ulao: Footsteps on the Bluff (Cave Creek, AZ: Property Purveyor, 2011), 21. ^ Lions Club, Grafton, Wisconsin: A Story of Industrial Progress, (Grafton, WI: Lion’s Club, 1952), 2. ^ Don Silldorff, “History of Ozaukee County,” Ozaukee County website (Mequon, WI: Mequon Historical Society, 1998), 1, last accessed July 21, 2017. ^ Lions Club, Grafton, Wisconsin, 3. ^ Noltze, Ulao, 21; “Jaunts with Jamie: More about Port Ulao,” Milwaukee Sentinel, March 8, 1961, https://news.google.com/newspapers?id=NW9QAAAAIBAJ&sjid=gREEAAAAIBAJ&pg=3346%2C3523193, accessed October 2015. ^ “Jaunts with Jamie: More about Port Ulao,” Milwaukee Sentinel, March 8, 1961. ^ Noltze, Ulao, 37, 41-42. ^ Town of Grafton Comprehensive Plan: 2035 (Grafton, WI: Planning and Design Institute, December 10, 2014), 15, last accessed July 21, 2017. ^ “County Population,” Ozaukee County, accessed September 22, 2015. ^ Town of Grafton Comprehensive Plan, 70. Noltze, Kathy. Ulao: Footsteps on the Bluff. Cave Creek, AZ: Property Purveyor, 2011.